The perfect steak: It's a simple yet elusive goal that some grill masters devote a lifetime to achieving. However, at these meccas of meat, expertly cooked cuts are within easy reach -- lovingly prepared with a minimum of ingredients. The perfect steak: It's a simple yet elusive goal that some grill masters devote a lifetime to achieving. However, at these meccas of meat, expertly cooked cuts are within easy reach -- lovingly prepared with a minimum of ingredients. At the best steakhouses across the country, it all begins with premium beef. Steaks are dry-aged and often seasoned with little more than a sprinkle of sea salt, allowing pure, unadulterated beef flavor to shine through. While some steakhouses give off an old-school vibe, others match their elegantly restrained cuisine with modern minimalist décor. No matter where you choose to carve your cuts, you can count on juicy rib-eye, tender T-bone and maybe even some market-fresh fish or lobster. 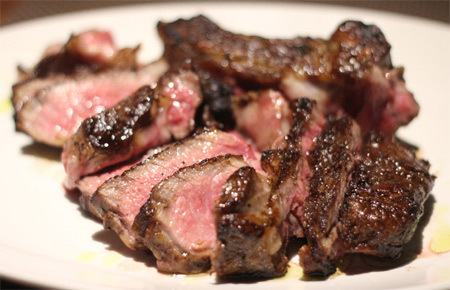 Marc Forgione's TriBeCa steakhouse is an 80-seat temple of red meat. The indecisive carnivore might have a difficult time deciding what to order. Let us help: The New York City cut, a 20-ounce bone-in rib-eye dusted with pastrami spices, is unique and explosive in meaty flavor. The tomahawk rib-eye for two, seasoned only with smoked salt, gives the former a run for its money. Bazaar Meat by José Andrés at SLS Las Vegas is a celebration of all things carnivorous. This massive, Philippe Starck-designed space boasts a raw bar, a fire pit and even a viewing area showcasing cured meats. Steaks come out sliced to share, like the 16-ounce Châteaubriand tenderloin, accompanied by a red wine and truffle Périgord sauce and pomme soufflé. This upscale boutique steakhouse is named after the Italian breed of cattle originally used for Bistecca alla Fiorentina. Michael's Restaurant Group (Michael's on Naples Ristorante, Michael's Pizzeria, Working Class Kitchen) teamed up with a domestic rancher to raise their own Chianina herd, which provides an exclusive source of high-quality beef. This Indianapolis landmark has been a favorite of visiting VIPs, local politicians, pro athletes and top entertainers since 1902. The atmosphere at St. Elmo Steak House is a little bit clubby, mixed with the aura of an old-school New York restaurant. The limited dinner menu is short on selections and long on flavor and size -- we recommend the legendary filet or bone-in cowboy rib-eye. "Top Chef" alum John Tesar uses Texas-raised, all-natural beef at Knife, his upscale Dallas steakhouse. The menu boasts a variety of specialty cuts in addition to house-made sausages, fresh seafood, pastas, seasonal salads and raw bar selections.